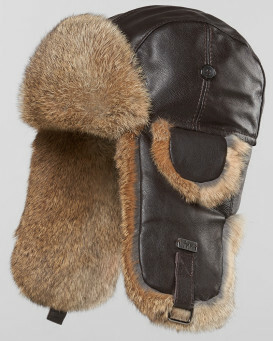 Our leather aviator trapper hats are a beautiful line of headgear that barrows from a fantastic mix of heritage. 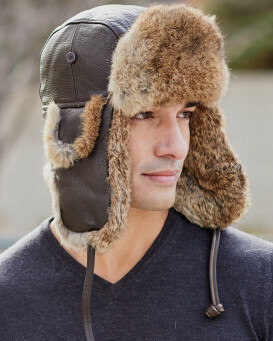 With roots in the bomber hats worn in the second world war, and of course the classic aviator hats which preceded them, these hats have also borrowed from our back country heritage with their fur elements and lines reminiscent of some of the finest vintage fur hats. They have been constructed using only the finest materials. 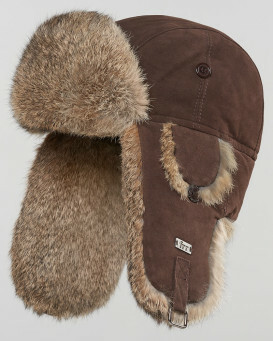 You can rest assured that only real rabbit fur has been used in the assembly of these hats. Real suede or leather shells will serve to provide you with that rugged look which is sure to be a real head-turner. High quality hardware will ensure that your hat is in perfect working order for many years to come. These hats are quilted on the inside for maximum comfort, and are also static resistant, which helps to avoid the dreaded hat-head. With all this attention to construction and materials it's no wonder that these hats are perfect winter accessories as well as being popular fashion statements throughout the seasons. The genuine rabbit fur will keep you warm even on bitterly cold winter nights, and if you flip the ear flaps up you'll find that the hat is perfectly comfortable even when it's not really cold. Sure, you won't want to wear it in the noon sun during high summer, but at night when things start to cool off a bit it'll keep you looking good. The color selection available in this line runs the gamut of leather looks. You have a gorgeous light leather shade in the vintage cork hat, and the line runs through a few shades of brown through gray and on to black. The suede hats are available in black or brown to ensure a classic compliment to your wardrobe. "I have a friend who wears a Russian fur hat daily to work from FHW so I asked him about his experience. 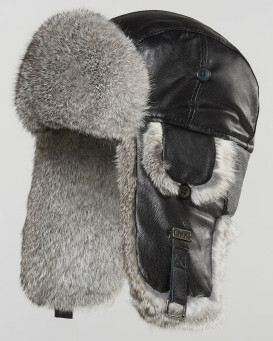 Based on that, I ordered the Black Lambskin/Gray Rabbit Aviator Hat with matching Gray Rabbit Mittens (see separate review). I was not prepared for seeing how well made these products are, when I opened the box! My head size is 6 3/4” and the small size fits perfect for me! There is nothing to block my vision when using my snowblower, even without using the chin strap snaps. The warmth and comfort level are awesome! I was out dog walking in 2 degree F weather with windchill and I could have stayed out all night, I was THAT warm, but not sweating by any means! I couldn’t be happier with my purchase! Highly recommend...."
Based on 933 customer reviews.